Support Palouse Habitat on #GivingTuesday Click here to donate! Today is #GivingTuesday, an international day of giving fueld by the power of social media and collaboration. 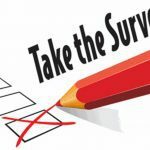 Your gift today will help finish the Poulsen home and start the Palouse house in 2019! 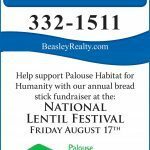 Stop by the Beasley Realty booth at the National Lentil Festival Friday, August 17. Buy a $1.00 breadstick to go with your chili — all proceeds support Palouse Habitat’s home building efforts!